What is a busy mom to do when dinner time rolls around and EVERYONE is hungry? Well, try this dish and watch your family eat it up. I love a hearty meal that you can create in a hurry and with simple, yet hardy ingredients. Really, it comes down to just taking a few moments to sauté the onions and fresh garlic before adding in the carrots, browning the beef and adding the pinto beans. Really, this is the perfect comfort dish that reminds me of my husband’s favorite food. Chili beans and cornbread. Seriously, he could eat it every week if I made it for him. The fact that this cornbread is baked right on top means no more dry cornbread for my family! I love the fact that this is cooked in one dish, which means the clean-up is fairly minimal. 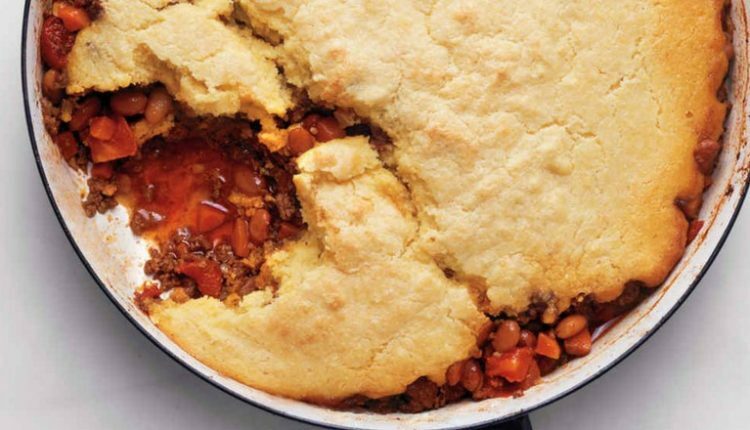 So, whether you are looking to take something to a cabin or just want a hearty Game Day Dinner, this Cornbread Chili Pie is a perfect dish. And for more of a Southwest flavor go ahead and add in some diced fire roasted hatch chilis and a can of corn. That really helps to stretch this dish out and if you are lucky, you might even have some for left overs. Quick Tip: Want to make this for a crowd? Go ahead and divide into individual ramekins with a dollop of sour cream and sprig of cilantro on top.